Bitcoin Fever: This Bubble will burst! Or not? Seven years ago, one Bitcoin cost 7 cents, today it sells for $ 4,110. So, if you invested thousands of dollars in Bitcoin in 2010, this investment is valued to over 58 million USD. Congratulations! And what's next? How does the classic author say: Predicting anything is complicated, especially when it comes to the future. But what is always worth it is to put together all related facts. And on their basis, you can make your own conclusions. What is the risk of error? Huge, of course. Just a quick summary: Bitcoin is a digital currency. Its value is given by the trust of people, there are no guarantees. Thanks to this trust (in Bitcoin's value), people accept Bitcoin as a payment and are willing to give something back (goods, work, services, other currency, etc.). The Bitcoin value is backed by nothing. Except for the trust. However, this does not differ from many other goods (paintings, postage stamps etc.) - even from other currencies. Gone are the times when the currencies of the states were backed by gold. Today, they too stay (and fall) with the trust of the people. But there is a difference here: The lawful currency of any state (fiat currency, forced currency) is an officially established currency that can officially repay liabilities. It is possible (to a certain extent) to rely on the state establishment that considers the liabilities and receivables in a given currency to be legal. In the case of the Bitcoin, there is not enough experience - can be such obligations enforced? And it's use to some extent depends on the benevolence of state apparatuses (whatever anybody things). How about the Bitcoin? According to number of people, Bitcoin is unique and offers many great features, its main positive feature is full decentralization and anonymity of transactions (subject to certain rules and to a certain extent). These qualities have earned him the attention - and the confidence - and hence the value. It may be worth mentioning here that Bitcoin coins are created by software and mathematical operations - so-called mining - are becoming more and more demanding - and thus they take more and more machine time. Creating new coins is therefore becoming more and more expensive. Their number is limited to the resulting approximately 21 million coins. It can be said that Bitcoin is rare. But Bitcoin is not the only digital currency. Only a specialized coinmarketcap.com site currently lists 851 currencies. Ethereum, Bitcoin Cash, which is known to have been recently forked from Bitcoin, Ripple or Litecoin. Each of these currencies has Bitcoin-like features and each has already gained some user confidence, so the value of one of their coins is tens or hundreds of dollars (with the exception of Ripple, the volume of which is counted in billions of coins). But as has been said: There are hundreds of digital currencies. Did you hear about the IOTA, Nem, Neo, Dash, Monero, BitConnect, Zcash, BitShares, Steem, Lisk, Factom, Bytecoin, Dogecoin, Siacoin ...? Some of them cost tens or hundreds of US dollars! Everyone can create a digital currency. So - Are coins in digital currencies rare? The answer is up to you. Of course, one must also take into account how hard can be to make the new currency trustworthy. 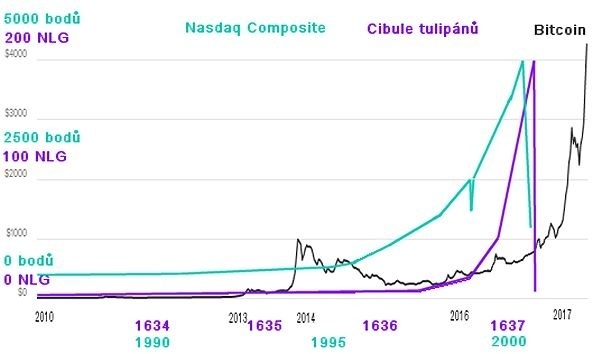 Bitcoin fans may not like it, but if what is happening around Bitcoin remarkably resembles an investment fever, we have to remind this story: In 1593, tulips onion came to Holland. There would be nothing special about it - and it hasn't been for a long time. Until 1634, when one such onion cost about one gulden. Interest in onions grew and a year later the price of one onion went up - to about 2 guldens. Still nothing special. In 1637, the price of the common bulb of a tulip rose to 60 gulden, which was already good growth. But even more interesting is the fact that rare varieties could cost in the same year 10 thousand guldens. Wikipedia tells a story of the exchange of the Utrecht brewery for 3 bulbs of rare tulip onions in 1637. In the same year, on the market, however, the supply of onions finally exceeded the demand - growing the tulip and getting more onions is not that complicated - and the price of onions quickly dropped to the original value ​​around one gulden. But we do not have to go so far in the past. Remember the internet (dot.com or dot-com) bubble at the end of the 1990s. The NASDAQ Composite Index, which is a stock market for most of the technology companies, has risen from about 500 points in 1990 to ten times that in 1999 and 2000. Then the bubble burst and in 2001 it reached around 1500 points. Keep in mind that it is de facto an index of the whole sector - so the fluctuations of individual stocks were still significantly higher at that time. Here again, trust in the Internet - and related technology assets - has brought a steep rise in prices. Whoever came in time earned a lot. Who was late - lost a lot. Naturally, none of the above information can be applied to Bitcoin. Will it continue to go up? Can we expect Bitcoin to cost ten thousand or perhaps a hundred thousand dollars? A million? Or is the bubble splashing? There are too many unknowns in the game. How high is the likelihood that other digital currencies will gain people's trust? If this happens on a larger scale, Bitcoin will gain strong competition, which may negatively affect its cost. But it does not have to - greater confidence in the other digital currencies can, on the contrary, encourage the growth of the whole sector. And what about new technologies that can facilitate the reception of any digital currencies? Currently, Bitcoin has a relatively privileged position, it is accepted by a number of shops. What happens to the Bitcoin price, when the shops begin to receive another ten, one hundred or a thousand of digital currencies? Let's also remember that classic currencies are somehow regulated. Central banks are trying to keep inflation in some borders, trying to boost competitiveness and correct the growth of national economies. And they have several tools, such as interest rates. There are no such regulatory mechanisms in Bitcoin. Somebody says that's right. Someone else will say it's wrong. What do you think? Many people are speaking for many months about the bubble about Bitcoin. The currency seemed expensive for many people for $100, $500, a thousand, two thousand... Now one Bitcoin coin costs over $ 4,000. Is it already expensive? Or it will rise to twice times, five times, hundred times, thousand times that? Much depends on the official position of the governments to this currency. If they ban digital currencies, their value may also fall. For a wide range of investors the currencies probably won't be sufficiently attractive under these conditions. Further discussions in Bitcoin community are ahead too. One division has taken place this summer (2017), further changes are expected in the autumn. After the first division, the Bitcoin price went up. What happens after more changes? Yes - there are many questions and no answers. This is the case in the world of investments. Who confidently answers questions about the future returns of investments should be suspicious. And the headline of this article? Again just a speculation. Maybe there's a bubble here, maybe it's not. In any case, Bitcoin is rather a speculative investment than normal currency in the investment portfolio. Autorem tohoto textu není redakce těchto webových stránek, ale jeden ze čtenářů/ek: Jarmar (kliknutím na jeho/její jméno přejdete na jeho/její domovskou stránku). Chcete-li si zde také vést deník nebo sem psát články, zaregistrujte se/přihlašte se na této stránce.